On Saturday(March 23rd) the Paley Center For Media's 2019 PaleyFest LA Presentation of 'Pose' was held at the Dolby Theater in LA. MJ Rodriguez was a beauty wearing a PRABAL GURUNG SPRING 2019 purple & red pleated, featuring a ruffle high neck and a cutout back & sides. Thankfully MJ wore white sandals with this color-block dress because it elevated the chic factor. Although if I had to complain, I wish her hair was completely off-the-shoulders. 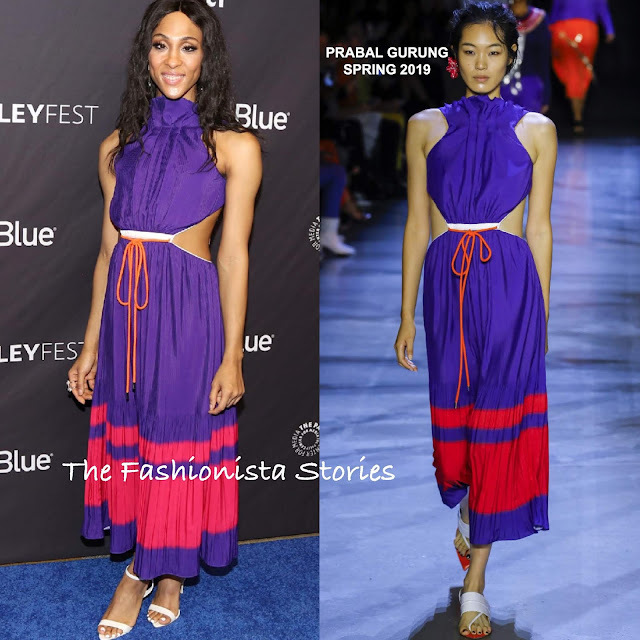 Janet Mock also wore a dress from the same PRABAL GURUNG collection as MJ(see above). Her yellow calf length dress, featured the designers signature button detail, and a sheer panel cape & hem. She finished up with metallic sandals and a complimentary beauty look. Indya Moore rocked an ALTUZARRA SPRING 2019 white cutout knit, ankle length dress, featuring cold-shoulders, a side front split and a fringe hem. Her dress was also adorned with an rope embellished belt. Love everything about her look here.